Later this month marks the one year anniversary of Xbox One. As we look back on the year, one of the best marks of progress for Xbox One has been our commitment to delivering continuous innovation. When Xbox One launched, we said we were deeply committed to our fans and our ongoing service updates have delivered hundreds of new features throughout the year. In fact, we launched a new website, Xbox Feedback, to enable us to hear from you directly and let you vote for your favorite ideas. We received thousands of new feature recommendations and more than three quarters of a million votes this past year, and your feedback played a huge role in shaping new experiences on Xbox One. Keep them coming! Here are some of the most popular new features added this past year, but also check out a recap of the full list of previously announced new features below. 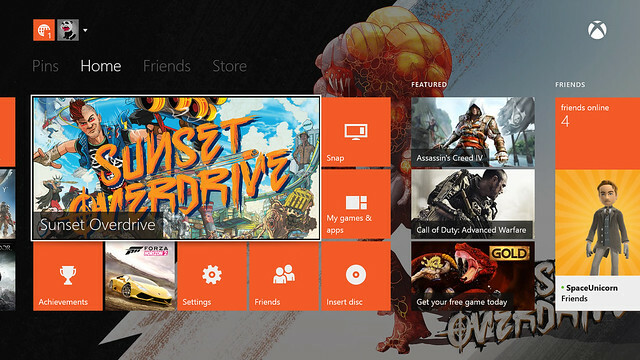 You may find a few surprises to help you make the most of your Xbox One. And rest assured, our commitment to continuous innovation remains strong. Custom backgrounds. The #1 fan-requested feature, each account on your Xbox One can have a customized background. You can choose a custom color or achievement art as your background on Xbox One, with more customization options coming down the road, like personalized images from the media browser app. Take system updates when you want. Take system updates as soon as they’re available if you prefer. When the system update is made available, you’ll find the option under Settings, then select System update. New Friends section. See at a glance what’s going on with your friends. You can stay up-to-date with your current activities, the most popular games your friends are playing, and a Gamerscore leaderboard to see who has improved their Gamerscore over the last 30 days. Activity feed updates. We added new ways for you to interact with friends in the activity feed. The interface changed to a single column scrolling list that is longer and includes more content. We added the ability to post text to your feed, and to “like” and comment on feed items. You can share game clips and anything else in the feed with friends either publically (to your activity feed) or privately (as an attachment to a message). You are also notified when anyone likes, comments on or shares your items. Each person gets a personal feed on their profile, so you can see what specific friends have been up to. And, with SmartGlass, you can see what your friends have shared to their activity feed and “like” specific posts. A New Achievements App. Updated to enable sharing of achievements you’ve unlocked with captions, see a list of friends who have unlocked specific achievements, and an updated achievements Snap landing page that shows Achievements on recently played games, when a gamer is not actively playing a game. Snap updates. We updated the Snap Center to include quick access to many of the things you wanted faster access to when playing a game – Friends, Messages, Achievements, Game DVR, clock, and battery indicator – as well as making it easier to close and open new snap apps when playing a game. A double tap of the Xbox button on your controller brings up a menu that allows you to open a new app in snap mode, close the current snapped app, or switch focus between your game and your running snapped app. Mobile purchase. Using Xbox SmartGlass or on Xbox.com, you can remotely purchase games and Add-on content. No more waiting to begin downloading when you get home – if your console is set to automatically take updates, your console will begin downloading your purchase. And, you can also get Games with Gold and Deals with Gold on SmartGlass, so you can download free games wherever you are to your console. Battery power indicator. We brought back the battery power indicator so that you can see right on the home screen how much juice is left in your controller’s battery. You will also get an on-screen notification when your controller battery is getting low. Silent reboot after system updates and system update on demand. If your console is in Instant On mode, the update will happen automatically and return to standby upon completion. This means you won’t need to power on your console after an update moving forward. If you want to take future updates when available without waiting for your console to do it on its own, this option is under system settings. It will only show as available when there is an update to take. Game and app saves and updates. A game save progress bar will show you the status of your game saves. You can easily tell what games and apps are being updated or have been updated recently. Boot to TV. You can set your console to boot directly to television when coming out of connected standby. Media Player, DLNA, and MKV support (and more!). A newly added Media Player app supports DLNA streaming so you can easily access and play music, watch photo slideshows or movies stored on home media servers and devices that support the DLNA server protocols. Additionally, you can playback tons of files – including MKV – stored on a USB device or a device on your home network that supports DLNA streaming. Xbox One Digital TV Tuner and Steam TV to SmartGlass. This USB-attached TV Tuner, available in UK, France, Germany, Italy and Spain, enables you to watch TV on Xbox One, and pause Live TV for up to 30 minutes. If you have an Xbox One Digital TV Tuner, you can stream TV across your home network to your smartphone or tablet using the Xbox SmartGlass app. You can also pause, play, rewind and change channels, without interrupting gameplay. TV Discovery Made More Social. New features were introduced for social discovery on TV, including Live TV Trending, Twitter TV Trending, Xbox TV Trending, and Tweets in MiniGuide. Sound mixer for apps with Snap and volume controls when using Kinect with chat. With the Sound mixer, you can control the volume levels of two apps when you’re using Snap letting you decide which app is louder. In this same section, you can control the volume levels when you’re using Kinect for chat. We can’t thank you enough for your continued feedback and working with us to make Xbox One even better.